A bizarre story in the Telegraph left me suspecting some sort of hoax. A senior space scientist associated with the Bulgarian Academy of Sciences, we are told, claims to be in touch with extraterrestrials. Lachezar Filipov announced the other day that "aliens are currently all around us, and are watching us all the time". They were not hostile, though they did have concerns about what human beings were doing to the environment (little Green men, I suppose), and hoped to establish communication with us "through the power of thought". In the meantime, Filipov and his colleagues are analysing crop circles, which he believes contain messages from the aliens. So has Filipov - a genuine astrophysicist with a fairly impressive CV - been contacted by extraterrestrials? Not exactly. The background to the story doesn't appear in any of the press or newswire coverage, but isn't hard to track down. Filipov's name appears along with several other Bulgarian scientists (presumably the members of his team) on a website called Our Planet, the avowed aim of which is to provide a communication tool between "the science" and the aliens supposedly responsible for creating crop circles. It also demonstrates the still powerful overlap between committed environmentalism and woo-woo. 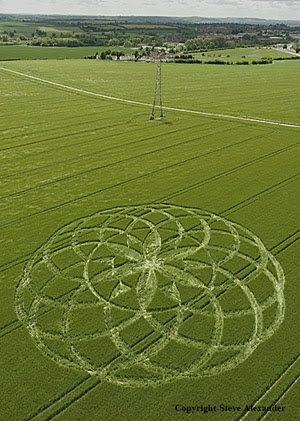 The site appears to be the brainchild of Mariana Vezneva, a Bulgarian writer described as "an expert in the cosmic language of symbols and allegories called Cenzar" and "a truly remarkable person with powers to unlock the secrets of the crop circles formations." She is "not a medium", we are told, but rather "a supersensory explorer who has been trained in the cosmic language of symbols for more than 20 years." Her "incredible discoveries" include (in addition to her crop circles breakthrough) "the code of symbols in the Cyrillic alphabet; the enigma of the natural numbers (1-10)". One of her aims in embarking on this project with Filipov is "to strengthen the links between the science and the invisible world by using this extraordinary communication tool for tackling the global earth crisis." Are we to expect a contact with extraterrestrial intelligence as part of the SETI projects in the nearest future? What is the symbolic meaning of the Sphinx of Giza and is the Sphinx older than the pyramids? Is the human species a product of the evolution process or it has been transported to Earth from another planet? Then everyone sat back and waited for the crop circles to form spontaneously (because, of course, they cannot possibly be man-made) in southern England. The formations were then interpreted by Mariana using her "telepathic skills". 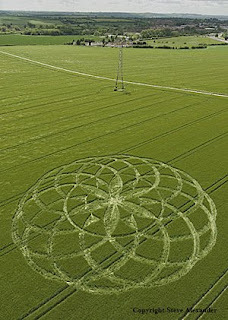 "The communication with crop circles intelligence was described as 'mental pictogram dialogue'." The picture shown above represents the extraterrestrials' answer to Filipov's question, for example. Not all the scientists' questions received a satisfactory answer: of the 16 posed, only 8 have been resolved. Perhaps the aliens didn't consider the unanswered questions interesting enough. C. A second meeting to be organized for those unable to attend the present one on which to be discussed a detailed plan for actions. The meeting was closed in uplifting spirit and rallying thoughts. It's nice to know that the spirit of unfettered scientific inquiry is alive and well in eastern Europe.